Percent Daily Values are based on a 2,000 calorie diet. Your daily values may be higher or lower depending on your calorie needs. These values are recommended by a government body. 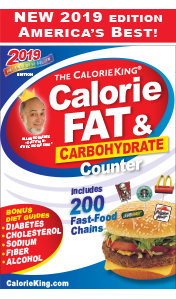 They are not CalorieKing.com recommendations. Based on a 35 year old female who is 5'7" and weighs 144 lbs. Copyright ©2019 CalorieKing Wellness Solutions, Inc.